In April, May and June 2014, the "Women's; Participation" project developed an activity entitled 'Project Zebra', which was shared with partner organisations such as JOINT (the League of NGOs in Mozambique), the Women's; Forum and Gender Links, to increase and improve the participation of women who are party members in the structures and leadership of their parties, and also as candidates for parliament. Meetings were held with members of parliament of RENAMO, the Women's League of MDM, as well as some members of the Municipal Assembly of Beira in Sofala province, with the objective of organising internal party workshops on the issue of women's; participation. This activity increased awareness of gender issues within political parties and among female party officials, and provided them with knowledge about specific tools to improve women's;s representation in elections and elected bodies. In 2013, EISA sponsored two TV roundtables to discuss the issue of women's participation in politics and in elections. This was part of a dissemination and public awareness campaign to publicize the results of a study conducted by EISA in late 2012 about levels of participation by women in decision-making bodies in Mozambique. With funding from the British High Commission in Maputo, EISA carried out a baseline study to survey the situation of women in Mozambique with regards to positions of leadership both in the public and the private sector in light of the SADC protocol on gender development. The 2008 SADC Protocol on Gender and Development establishes among its objectives; "to empower women, eliminate discrimination, and achieve fairness and gender equity through the development and implementation of legislation, policies, programs and projects." Part 1 of Article 12 states that member-states; "shall endeavor that, by 2015, at least fifty percent of decision-making positions in the public and private sectors are held by women including the use of affirmative action measures". A study was carried out on the position of women in Parliament, the Executive and Public Administration, Provincial Governments, Municipal Governments, the three political parties with seats in Parliament, the Justice sector, the Higher Education sector, the Media and the Private sector. Women were under-represented in all examined sectors: In all areas examined, numbers of women were inferior to those of men in decision-making and leadership positions. Of all 2,000 positions surveyed, women occupied only a quarter (25.7%). There were significant variations between the surveyed sectors: The Parliament is the sector with the largest percentage of women, with 39.2%, followed by the political parties with parliamentary seats, with 32.9%, and the Justice sector, with 24.7%. In the Private, Media and Academia sectors, women occupied only 17.8%, 19.1% and 17.5% of leadership positions, respectively. There were also differences within the examined sectors: Despite representing a significant portion of seats in Parliament, women still occupied a relatively small space in senior Parliamentary positions in general, with only 29%, but excelled in the category of Parliamentary Group Leaders, in which they represent 66.6%. In the Justice sector, the second largest representation of women by sector, women outnumbered men only in the category of Provincial Attorneys-General with a percentage of 54.5%, but the overall position within the sector is only 24.6%. Women were scarce in business, media and academic decisions. Political leadership remained a male domain: The leadership of the three parties represented in Parliament was dominated by men. No woman held the position of President or Secretary-General in any of the three parties and women held only 32.9% of senior leadership positions. Assist in the development of a women's; electoral agenda. Advocate for a greater number of women candidates in electable positions. Assess the training needs of elected women in selected municipalities. 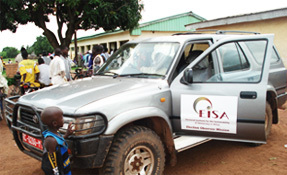 Starting in 2009, EISA met with Forum Mulher as well as a wide consortium of women's organisations, and the Foundation for Community Development (FDC) headed by Mme Graça Machel, to launch a campaign to encourage political parties to nominate higher numbers of women candidates for the 2009 general elections. This move was in line with the SADC Protocol on Gender and Development that establishes that SADC member states must achieve gender parity at all levels of decision-making by 2015. As part of this effort, EISA, together with women's;s NGOs, met with members of the Elections Offices of different political parties and their respective Women's;s Leagues. Both FRELIMO and RENAMO, the two main parties, nominated high numbers of women for parliament (close to 40% of their candidates each). As a result, 38.4% of the Mozambican Parliament is made up of women, the third highest percentage in southern Africa.